Your standard homeowners insurance does not have flood insurance included. Flood insurance is commonly offered by the National Flood Insurance Program or NFIP. John Hendry Insurance Agency can find you a flood insurance plan that will fit your needs. Far too many omeowners never think about needing flood insurance until it’s too late. There have been countless instances in Louisiana where rains cause the water to rise, or filled small streams, turning them into rivers that creep higher onto property and eventually into homes. John Hendry Insurance Agency can help you with a flood insurance quote. We will search for the best flood insurance rates and proper flood insurance coverage to protect property, possessions and structures. Flooding and other surface drainage problems can occur well away from a river, lake, or ocean. If you are looking at property, it is a good idea to CHECK out the possible flood hazard BEFORE you buy. Some items, such a photographs and heirlooms, may never be restored to their original condition. The impact of a flood—-cleaning up, making repairs, and the personal losses—-can cause great stress to you, your family, and your finances. Floodplain Management Regulations: To ensure that structures will be protected from flood damage, the Floodplain Management Division of the City of Zachary regulates all development in Special Flood Hazard Areas (SFHAs) and outside SFHA’s. Filling and similar projects require a permit and are prohibited in certain areas. Existing structures substantially damaged by flood that are located in the SFHA must be elevated 1ft above the Base Flood Elevation (BFE) before they are repaired. Consult with our office if the property is in a SFHA; if it has ever been flooded; what the flood depth, velocity, and warning time are; if it is subject to any other hazards; and what building or zoning regulations are in effect. Ask the Real Estate Agent if the property is in a SFHA, if it has ever been flooded, and if it is subject to any other hazards, such as sewer backup or subsidence. Ask the Seller and the Neighbors if the property is in a SFHA, how long they have lived there, if the property has ever been flooded, and if it is subject to any other hazards. Flood Protection: A structure can be protected from most flood hazards, sometimes at a relatively low cost. New construction and additions located within a SFHA or non-SFHA must be elevated 1ft above the BFE or adjacent BFE, nearest manhole, or centerline of the street, whichever is highest. Existing structures can be protected from shallow floodwaters by regarding, berms, or floodwalls. If the structure is located in a SFHA, flood insurance will be required by most mortgage lenders. Ask an Insurance Agent how much a flood Insurance policy would cost. In most cases, there is a 30-day waiting period before flood insurance takes effect. Flood Insurance: Homeowners insurance usually does not include coverage for a flood. One of the best protection measures for a building with a flood problem is a flood insurance policy under the National Flood Insurance Program, Which can be purchased through any licensed property insurance agent. If the building is located in a floodplain, flood insurance will be required by federally backed mortgage lenders. Ask and insurance agent how much a flood insurance policy would coast. To ensure that accurate information is received when contacting the Floodplain Management Division, please be prepared to provide the address, lot and block number, parcel number, legal description, or other identifying information when making your inquiry. National Flood Insurance Program (NFIP): Our community participates in the NFIP, which makes federally backed flood insurance available for all eligible buildings, whether they are in a Floodplain or not. 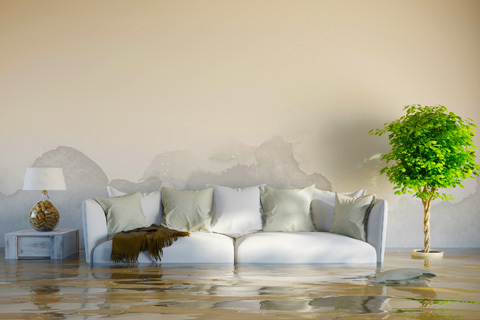 Flood insurance covers direct losses caused by surface flooding, including a river flowing over its banks, a lake or ocean storm, and local drainage problems. Mandatory Purchase Requirement: The Flood Disaster Protection Act of 1973 and the National Flood Insurance Reform Act of 1994 made the purchase of flood insurance mandatory for federally backed mortgages on buildings located in Special Flood Hazard Areas (SFHAs). It also affects all forms of Federal or Federally related financial assistance for buildings located in SFHAs. The SFHA is the base (100-year) Floodplain mapped on a Flood Insurance Rate Map (FIRM). It is indicated as one or more zones that begin with the letter “A” or “V”. Federal financial assistance programs affected by the laws include loans and grants from agencies such as the Department of Veterans Affairs, Farmers Home Administration, Federal Housing Administration, Small Business Administration (SBA), and the Department of Homeland Security’s Federal Emergency Management Agency (FEMA). How it Works: Lenders are required to complete a Standard Flood Hazard Determination (SFHD) form whenever they make, increase, extend or renew a mortgage, home equity, home improvement, commercial, or farm credit loan to determine if the building or manufactured (mobile) home is in an SFHA. Copies of the FIRM are available for review in the Floodplain Management Division of the City of Zachary. Lenders may also have copies or use a flood zone determination company to provide the SFHD form. If the building is in a SFHA, the Federal agency or lender is required by law to require the recipient to purchase a flood insurance policy on the building. Federal regulations require building coverage equal to the amount of the loan (excluding appraised value of the land) or the maximum amount of insurance available from the NFIP, whichever is less. The maximum amount available for a single-family residence is $250,000. Government sponsored enterprises, such as Fannie Mae and Freddie Mac, have stricter requirements. The mandatory purchase requirement does not affect loans or financial assistance for items that are not covered by a flood insurance policy, such as vehicles, business expenses, landscaping, and vacant lots. It does not affect loans for buildings that are not in an SFHA, even though a portion of the lot may be. While not mandated by law, a lender may require a flood insurance policy, as a condition of a loan, for a property in any zone on a FIRM. If you feel that a SFHD form incorrectly places your property in the SFHA, you may request a Letter of Determination Review from FEMA. This must be submitted within 45 days of the determination. More information can be found at https://www.fema.gov/how-request-flood-hazard-determination-review-fema.